Here is a record that belongs to a friend who listeners to Radio Dismuke special broadcasts know as “Leslie From Dallas.” “Red Wing” is one of her favorites and she wanted to have a digital copy. Both of these selections are examples of Indian intermezzos – a fad during the ragtime era of songs with an American Indian theme. 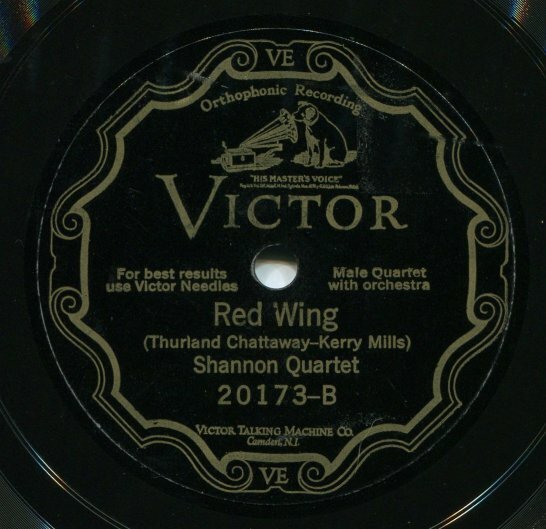 “Red Wing,” composed in 1907 by Kerry Mills with lyrics by Thurland Chattaway, is one of the more famous of the Indian intermezzos. My first exposure to the song was a doo wop era 45 rpm I had as a child of Sammy Masters performing it under the title of “Rockin’ Redwing.” Years later I was a bit surprised when I stumbled across the same song on a 1910s era acoustic record. (The Sammy Masters version can be found by doing a YouTube search). “Rainbow” was composed in 1908 by Percy Wenrich with lyrics by Alfred Bryan. I was unfamiliar with this song until I digitized the record. As much as I enjoy “Red Wing,” of the two, “Rainbow” is my favorite. The Shannon Quartet was an influential vocal harmony group that later changed its name to The Revelers. 78 rpm records of The Revelers that made their way to Europe inspired the formation of the better remembered German vocal group The Comedian Harmonists. (The story of the Comedian Harmonists was made into a 1997 film that I highly recommend for anyone who enjoys music of the 1920s and 1930s). 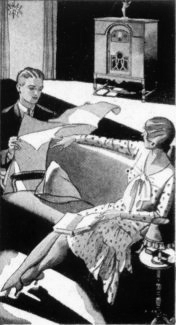 This entry was posted in 1900s Popular Music, 1920s, Electrical Recordings, Ragtime. Bookmark the permalink. I once bought a CD of the Comedy Harmonists under the misapprehension they were a mouth organ group. Harmonists/Harmonicists … you see where I got confused.